Virginia Tech suffered a tough 69-68 defeat at the hands of Miami on Saturday afternoon. The loss dropped the Hokies to 21-10 overall and 10-8 in ACC play. The Hurricanes improved to 22-8 overall and 11-7. The defeat locks Virginia Tech into the No. 7 seed in next week’s ACC Tournament. Had they won the game, their chances of a double bye and being seeded No. 3 or No. 4 would be have been very strong, but it wasn’t to be. They will play on Wednesday night at 7pm, against either the No. 10 seed (Notre Dame) or No. 15 seed Pitt. This was a game of runs, and Miami had the ball last. With the score tied at 68, Miami freshman point guard Chris Lykes was fouled by Justin Robinson on a drive to the basket and awarded two free throws with three seconds remaining. He made the first free throw, missed the second, and Chris Clarke’s halfcourt heave was no good. 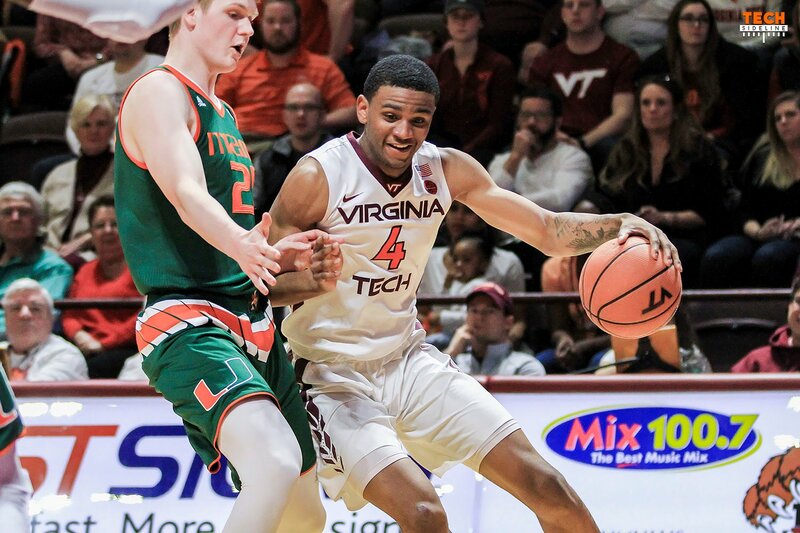 Lykes didn’t appear to be fouled very hard by Robinson, and in any case most officials swallow their whistles in late-game scenarios, but that wasn’t the case in Saturday’s game. Nevertheless, the Hokies have only themselves to blame. They led by as many as 12 points, but got sloppy with the ball before halftime, allowing the Hurricanes to cut the lead to 39-32 at the intermission. Tech was still in good shape, but they played poor defense to open the second half, with Miami going on a 15-3 run to take a 47-42 lead with 15:17 remaining. During Miami’s run, the Hokies did not play good defense, and though Tech was also in an offensive rut, it was the Hurricanes’ ability to score that got them back into the game. Tech settled down after that, and later rallied from a 9-point deficit to take the lead 68-66 on a pair of Chris Clarke free throws with 1:13 remaining. On Miami’s ensuing possession, Lonnie Walker made a big time fadeaway jumper from the baseline against good defense to tie the game at 68 with 55 seconds remaining. Kerry Blackshear then missed an open three-pointer with 44 seconds, and Ahmed Hill pulled down the offensive rebound. The Hokies got the ball to Justin Bibbs, who drove the lane as the shot clock was winding down. He spun into a scoring position, and had a decent look at the basket, but his shot was short, there was a scrum for the loose ball, and it bounced off his fingertips out of bounds. Miami took over with 13 seconds on the clock, and that’s when Lykes was fouled by Robinson to close out the game. Virginia Tech lost this game partly because of poor defense early in the second half, and partly because of their turnovers. The Hokies committed 15 turnovers, including an uncharacteristic six by Robinson, though he did have 18 points and six assists as well. Those turnovers spoiled a 46.9% shooting performance that included a 9-of-20 (45%) mark from three-point range. Tech also handily beat Miami on the boards 33-26, including a 10-6 advantage in offensive rebounds. Saturday’s game was just the second time this season that the Hokies have lost after holding a halftime lead, with the other coming on December 16 at Kentucky. Despite the disappointing end to the regular season, the Hokies are still a lock for the NCAA Tournament, and they can improve their seeding with a good run in next week’s ACC Tournament. We’ll have an ACC Tournament preview early in the week. Very late comment as I’ve traveling. Heard the game on XM, with the UM call. Their announcers were very respectful, and gave VT lots of props. From what I heard on the radio, I agree with this article: we lost the game on our own. Tough loss for the Hokies. This was a very winnable game and could have really boosted them from a seeding perspective coupled with the Duke win and a very manageable trip to the ACC semis. Now in their first game they are likely to play a once again healthy Notre Dame team that was top 10 early in the year when healthy. As much as I like your passion, watching the replay of that questionable foul call on 5, he did “reach in” from behind once Lykes got by him and hit his arm from the back. Agree that most refs swallow their whistles at that point in the game, but it appeared to me to be a legitimate foul. I don’t think it could have been better said! The problem is the Robinson reached, giving the ref all the excuse he needed to call a foul. I couldn’t tell if Robinson touched him or not. If he did, it was very miniscule, and damn sure didn’t cause Lykes’ fall. But reach in fouls get called without an actual foul occuring all the time. You just don’t expect it to be a game deciding call that drops a team 4 tournament seeds. So we’ll win the first ACC tourney game then prob lose the second. Same goes for NCAA. About what I expected at the beginning of the season. Yeow, how about a little positive thinking. We can do a lot in the post season. Have a little faith. Hope we don’t have to play Notre Dame in the ACC tournament. Bonzie’s back. I almost went to Woodstock on a whim – totally out on character and turned around at D.C. The only other time was a trip to New York for the 73 NIT. Several of Robinsons TOs were the result of trying to dribble too much and thru/around people at the free throw line. He was obsessed with trying to drive on Lykes and paid the price several times. Yep…..this was a game where Robinson was trying to do way too much and look way to fancy with the rock. Too me it was obvious he was trying too hard to one up Lykes in the head to head battle. He lost sight of the bigger picture and tired himself out in the process. That foul at the end was a lack of focus and fatique foul. JRob didnt even pick up Lykes properly when he crossed the half court; in a split second Lykes was already inside our interior defense driving for a layup. JRob basically killed his probability to defend Lykes straight and square the moment he allowed him to have speed and momentum as he crossed halfcourt line. Also, there were too many players getting burned trying to provide help defense. You can’t choose to leave 3pt snipers at the line just to help on the inside. We were helping down and selling out to stop a two at the cost of giving up the three….just plain silky. Several players were not trusting their teammates tonight. Uggggh. Buzz stated clearly that helping inside is what this team is going to do, and if it leaves some open 3’s, then that’s a risk we have to take – as I understood it – after the Duke game. And I don’t think that is “plain silky” at all. Turnovers and foul shots cost us the game. What a shame!